Pullingworld.com wishes you and your family a happy new year and all Pullers a successful and safe 2008 season! We (Clarke Pulling Team) managed to get Top Gear magazine interested to come to Bettborn and write a good story about our team in September. Here is the link to the web-version, as I think it was something positive for the entire pulling scene. Lots of people have seen this in the uk, but many overseas will not. Click here for some more new pictures from Edewecht! After visiting the Red Painter Team, I took my 7 year old nephew Vincent and we both drove to Balkbrug to see the "Diesel Power Beurs". Vincent and I both shot a lot of pictures of the tractors on exhibition there for you to see. Been visiting the Red Painter Team this morning. The guys have put a nice paint job on the tractor and are working hard to get it ready for Zwolle. The engines have all been fitted with new internals and MSD 44s, and three additional spare blocks should be enough to get them through their first season! I have started a new project for 2008, called "Pullingworld.com video production". 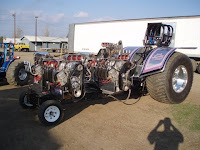 Bring Tractor Pulling videos to the fans in a timely manner and overall (and as usual) free of charge! I will try what I can to produce free videos on my own. If anybody wants to add videos, too just send me a DVD / Video CD or upload to Google video on your own. This is a way for promoters to get the word out about their events (how about getting last years pull online?). Of course money has to be made to justify it, so I am offering advertising space in the videos I'll do. 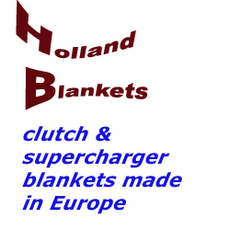 BTW: Will go to the Diesel Power Beurs in Balkbruk tomorrow late afternoon. For all of you who currently sit at home, bored during the holidays, there is some places to go to in the next few days. On the 29th of december there is the Diesel Power Beurs at Balkbrug/NL (Diamanthal) from 13.30h to 21.00h and on the 30th December the Basrijs guys have a little Indoor Pull at Etten-Leur/NL, starting from 13.00h to 19.30h. I might pay a little visit to the Diesel Power Beurs with some of the hot farm guys from this area. Not even 100km and I ain't got nothing to do right now anyways... depends on my health though. Might give me the chance to give my new video cam a try. The fourth edition of Indoor Arnhem, Europe's biggest indoor tractor pulling event, will take place on saturday, april 12th 2008. This is a new date. Been digging through old photo albums and ran into a few pics from Turkey Troot 1978. I was released out of hospital this morning. It all just started with a kidney stone - which got stuck in between my kidney and my bladder and blocked the exit of my left kidney. At the first stay in hospital, they've put a hose from the kidney to the bladder, so the water could be released and it all could swell down to remove the stone later. Was sent home with that - but the hose got plugged and so the exit of my kidney was plugged again. Put me under anesthesia - removed the hose, crushed the stone, removed it all - and put a new hose back in, as it was now swollen even more. Three days later that hose was plugged, too - and we did it all over again. Had to put me under anesthesia again as the first time, with part anesthesia, the doctor told me: "You almost jumped off my table!" Now everything seems to be ok and I drove to my parents place this noon. I am still a little weak on my legs and sleep a lot - but at least home for Christmas! I hope to be back in action before New Years. No idea when I will be back out, but I hope mid of next week to be home in time for Christmas. Coverage of the Pull at Den Bosch of course is impossible now. I am back home in so / so condition. 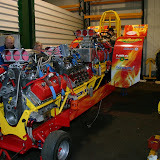 I had actually planned to go see the indoor pull in Den Bosch on saturday, but I am not too sure I am in good enough condition to go there - yet. The European Maid of Bram de Pijper and their own Terminator. 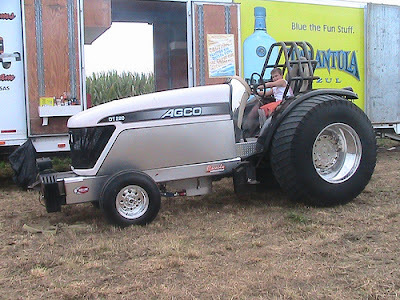 Tractorpulling.tv has added another hot farm event to their list of broadcasts, Harskamp to be exact. My step daughter, May, who most of you know or have met is entered in to a modelling competition for Miss Teen Princess UK 2008 (13 to 15 year olds), which is part of the Miss Teen Queen UK competition. She has qualified to the photo final which is a web based vote (by text or phone) to select the finalists for the 2008 competition to be held next year. Previous winners have gone on to model at such events as the Clothes Show Live and other prestigious venues so this is a real opportunity for her to forward her modelling career. To qualify she has to finish in the top 5 as far as the on line voting and then has to be picked by a panel of judges from this shortlist to hopefully qualify for the grand final in London next June. The voting has just started and finishes on 1st January 2008 at 12pm. Attached is a leaflet with the text vote line, send it as listed – Jennifer May Norris to 84205 with a capital as the first letter of each name and 1 space between them. From outside the UK you will need to phone your vote in. By phone the number is 0044 (0) 901 656 1515 and May is contestant number 22. The web site link is below should you want to see her photo on it – select Contestants from the main menu on the left hand side and she is number 22. You can vote as many times as you want to for her and any of your friends are welcome to support her!!! Check the Edewecht website for pictures of the rebuild of the original Red Shadow sled. Nothing serious, just a kidny stone that needs to be removed. 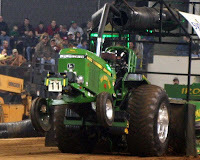 Check out who will compete in the 2008 NFMS Championship Tractor Pull! Have a close look at the 10.200 lbs Pro Stock session on Friday. Lucien Keulers from the Netherlands will run his new "Turn me Loose" tractor there. Since the event on April 26th and 27th 2008 will be official 30th anniversary of the team, a special "Jubiläumsticket" is avaliable. For only 17 € you'll get entry for both days, free entry to the puller party and a free Pott's drink! This ticket is only avaliable through the pre sale. The Green Monster team will try to get all 2007 Euro Cup champs to the pull and will also raise the purse for the 4.5t modified class quite some, to get a good field of competitors. For the saturday a total of 1800 € was put up in price money for Stock and Super Sport competition, that is open to anybody who has a tractor built according to the (ETPC/NTTO/STPV/DTTO) rules. website for their new promotion video! Also buy tickets online and win a Club Car! 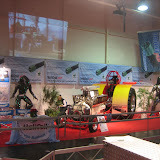 Some pictures of the german tractor pullers exhibiting at the Essen Motorshow. Essen Motor Show is the Number-One Motor Sport Fair in Germany. From the racing car to the Formula 1 star - at the Essen Motor Show 2007, motor sport is once again a very high priority. As a meeting place for active motor sportsmen and sportswomen, former racing drivers, sponsors and fans, the fair is regarded as the most important date at the end of the season throughout the scene. In total, 110,000 visitors came to the Essen Motor Show on the starting weekend - although the duration has been shortened by one day. The fair will last up to and including next Sunday. Joop Wouters and Markus Pape make the deal perfect shaking hands. The tractor is now home in a new shop in North West Germany. 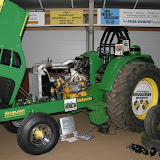 The fenders and rollcage had already been repainted before and thus the first pictures in the new color scheme could be taken, before the tractor was now disassambled down to the last bolt, to get renovated. and will then be joined by one completely new Knox KB, giving the LP team three engines to run and one in spare for the 2008 season. The legendary modified puller Art Arfons passed away today, December 3, 2007. The Akron, Ohio puller was well-known for his turbine-powered "Green Monster." Art was 81-years-old. Cards of Sympathy can be sent to his daughter Dusty (Arfons) Spraggins at 1941 Stimpfel Dr., Uniontown, OH 44685. Don't forget the sunday evening Pulling Chat!